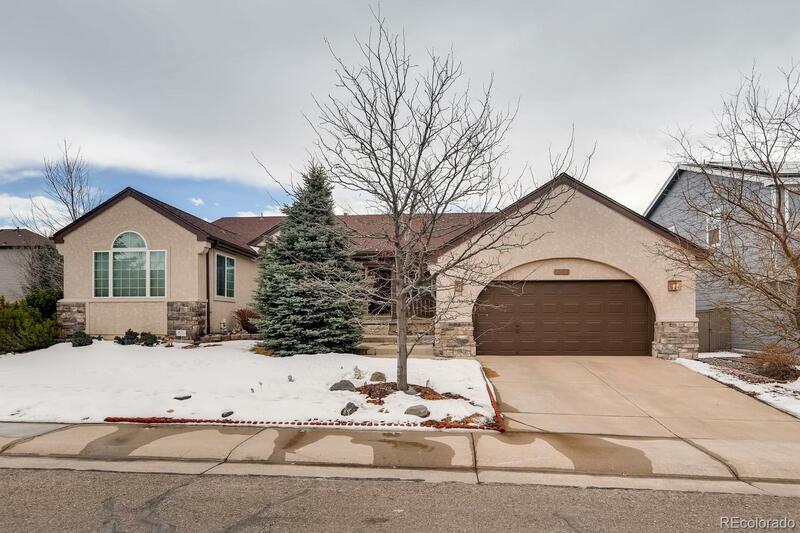 Immaculate, updated one-owner stucco ranch on corner w/finished basement close to middle & high schools. New stunning hardwood looking non-scratch tile floors. Gorgeous granite counter tops on large island, wall-to-wall counter and butler’s pantry. Breakfast nook & formal dining room. Family room w/gas fireplace & custom wall unit. Master suite has vaulted ceiling & 5 piece updated bath w/ jetted tub. Main floor study. Spacious finished basement w/half bath offers tons of flex space for hobbies, exercise or teen lair. Basement includes spectacular train room. Fans throughout & tons of storage. Fenced backyard w/patio & composite deck w/pergola, surrounded by plants & trees. Separate large dog run, garage floor coating, double oven, induction cooktop, trash compactor, touchless kitchen faucet, security system, WIFI controlled Ring Doorbell, Sprinkler System & Nest. Seller will credit buyer $5000 toward customizing the basement layout to suit their needs. MUST SEE!